Maybe the Space Force won’t be a separate department after all, but it could be a separate military service within the Air Force. A U.S. official confirmed to ABC News that the White House has asked the Pentagon to explore alternatives to the creation of an independent space force, including a model similar to how the Marine Corps operates as a service within the Navy Department. The White House request was first reported by Defense One, citing an Oct. 26 White House memo instructing the Pentagon to explore alternatives to the creation of a Space Force as separate military department. A U.S. official confirmed to ABC News that the White House had asked the Pentagon to explore multiple options to meet the president's intent for a new military service dedicated to space. Those additional options include the creation of a Space Force operating as a new sixth military service under the Department of the Air Force model, where a new space service would fall under the Department of the Air Force or could be as a completely separate department with its own civilian secretary, said the official. Creating a new Space Force under the Department of the Air Force would be a model similar to how the Marine Corps operates as a separate service under the Department of the Navy. The creation of a "Space Corps" has garnered bipartisan congressional support in the past. 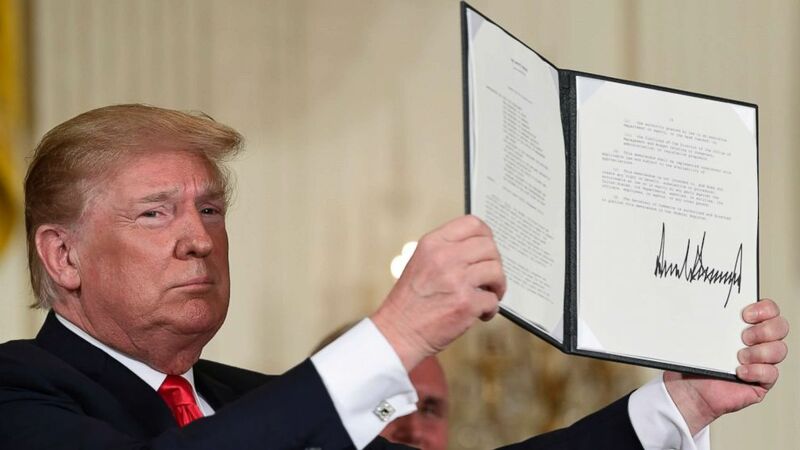 (Susan Walsh/AP) President Donald Trump holds up the space policy directive that he signed during a National Space Council meeting in Washington, June 18, 2018. The official stressed that all of the options are intended to meet the president’s intent for a separate space service, whether inside or outside of the Air Force. "We are going to have the Air Force and we are going to have the Space Force – separate but equal," Trump said. In line with his comments, the Pentagon has focused on creating a new Space Force under a new Department of the Space Force, a move that would require congressional legislation. "In concert with the guidance, direction, and vision from the White House, we are generating options for the Space Force as a sixth military service branch,” said Lt. Col. Joseph Buccino, a spokesman for Deputy Defense Secretary Pat Shanahan, who heads the Pentagon's efforts to create a new military service. But the U.S. official said that the internal discussion to meet the president’s intent has evolved to include a review of additional options. (Trump Campaign) Logos for the new Space Force were released by the Trump campaign to supporters to vote for their favorite, Aug. 9, 2018. A second U.S. official told ABC News that that there have always been different options to get to a space force. An Air Force document obtained by ABC News in September estimated that the creation of a new Space Force might cost $13 billion. But in mid-November, Shanahan told reporters he believed that the cost might be in the single digits and that "it might be lower than five" billion dollars.